Seamless Gutters | Portfolio | F.A.Q. 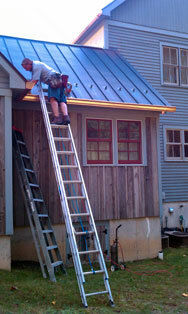 Triangle Seamless Gutters is an owner operated insured business that has been providing gutter solutions since 1985. With over 25 years experience, installing tens of thousands of gutter systems, we are experienced in completing the simple straightforward job to the most demanding and complex job. We take the time to explain why, how and what we are doing to design your gutter system. We ensure that you get what you want the first time, and your gutters are installed by an experienced, courteous expert. We pride ourselves on professional service and all our clients are given a customer pledge of satisfaction. We use high quality .032 gage aluminum that is backed by a 20 year warranty. 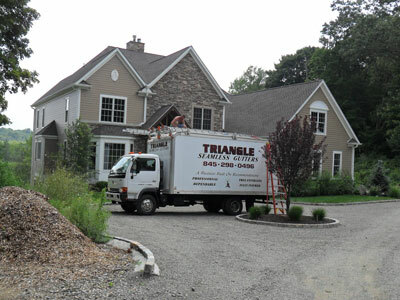 Triangle Seamless Gutters provides high quality, professional services to residential and commercial customers from lower Westchester County up to Albany in upstate New York. Call upon the expert at Triangle Seamless Gutters and let him educate you on the importance of installing a properly designed gutter system for your home. Dependability: We pride ourselves in arriving on-time, or we notify you in advance of emergency/unexpected situations in order to respect your time. Service: We will provide outstanding customer service and will try to meet all customer’ expectation. Cleanliness: At the completion of each project, we will perform a final cleanup and will leave the site as it was or better than original condition. Quality: We will adhere to all manufacturing standards and specifications and to our own strict standards of installation. Respect: We will treat each customer with the utmost respect and common courtesy. Honesty: We value each relationship and we will be honest in our communication with our customers and associates. Pride: We pride ourselves in providing the highest quality workmanship from beginning to end and we back up each project with a warranty that if you do have a problem, call us and we resolve it to your satisfaction. Safety: We will adhere to strict safety regulations and standards for the protection of our customers and our employees. Home | About | Contact | Seamless Gutters | Portfolio | F.A.Q.